This article or section is incomplete. You can help SmashWiki by expanding or finishing it. The menu screen for Squad Strike. The character selection screen for Squad Strike. Squad Strike (団体戦, Team Competition) is a multiplayer mode in Super Smash Bros. Ultimate that enables players to fight against each other with a squad of either 3 or 5 fighters. The mode can be played in three formats: Tag Team and Elimination, which both have the winner of each round stay in, ending when one squad eliminates all characters from the other, and Best Of, which has characters from both sides swap out each round, and ends after all 3 or 5 fixed matchups are played. 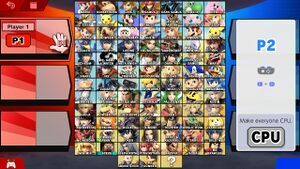 In all formats, after the characters are selected for each squad, each player selects the order of fighters within the squad via discrete button inputs. The order is not revealed until both players have confirmed their choices. From that point onward, the order of the characters is fixed. Replays can't be saved in this mode. In this format, the entire 3v3 or 5v5 match takes place in a single continuous battle, with each character loading seamlessly onto the field after the previous one is defeated. This concept was formerly utilized in the final battle of Smash Tour in Super Smash Bros. for Wii U and as a single/co-op feature in Adventure Mode: The Subspace Emissary from Super Smash Bros. Brawl in stages with multiple characters or in all of the post-game. It is also used in the final battle in World of Light. Players do not change characters until they are defeated, creating a "winner stays" format within the single battle, and the ultimate winner of the match is the player who eliminates all fighters from their opponent's squad. This format is similar to Tag Team, but each round is a separate battle, with a return to the menu screen each time a fighter is defeated. Otherwise, it has the same features, with the winner of each round proceeding to take on the next character from the enemy squad, and the ultimate winner being the one with the last fighter(s) standing. The winning character keeps their current stock count from round to round, but can optionally recover some damage between rounds. This format features a fixed series of 3 or 5 rounds, with each round matching up a new character from each team. Players will return to the menu screen between each round. The winner is the player with the most rounds won after all matchups are played. The odd numbers available as squad sizes ensure this format cannot end in a tie. The starting number of stocks for fighters can be set, as well as a time limit for each round (or the entire match in the case of Tag Team). 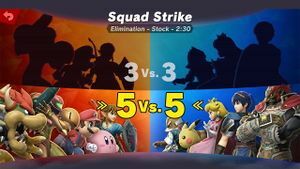 In addition to the full complement of standard Smash mode rules, Squad Strike's advanced rules allow choosing the number of stages to be played, as well as how much damage the victor recovers between rounds in Elimination format. Although Squad Strike has only two player slots, an option for quick controller switching is available on the menu screen between rounds in the Elimination and Best Of formats, allowing teams of players to hand off control with one character per team member. If using the Elimination format, this creates a style of gameplay comparable to a crew battle. Squad Strike has seen dedicated tournaments. It is currently being debated if certain Echo Fighters (namely Dark Pit, Daisy, Richter and Dark Samus, who are agreed to be the most similar Echo Fighters gameplay-wise) should be allowed on the same team as their counterparts. However, Lucina, Chrom and Ken are expected to be allowed due to being more different gameplay-wise. This page was last edited on April 21, 2019, at 21:16.